Allison Peters Quinn, Curator at Hyde Park Art Center, Chicago, interviews artists Jim Duignan of Stockyard Institute & Rachel Harper of Seen + Heard during the exhibition PUBLIC SCHOOL. Unlearning and public education are some of the ideas addressed in PUBLIC SCHOOL, the current exhibition at Hyde Park Art Center (HPAC) Chicago, USA, this spring. Artists Jim Duignan, of Stockyard Institute, and Rachel Harper of Seen + Heard, created the project and charge the art gallery with an interactive installation designed to spark minds of all ages to ask questions and use their hands to build the answers. Here, curator Allison Peters Quinn talks with Jim and Rachel about their thoughts on self-education, pedagogy and the need for a Utopian Center for Civic Love. APQ: Stockyard Institute’s Pedagogical Factory (2007) was such a touchstone show at HPAC. It was the first time HPAC’s exhibition programme of contemporary art aligned with our school/education interest in engaging teens and introduced an artist residency programme all in one. The exhibition was the catalyst for collaboration between artist and institution to develop a viable platform supporting neighborhood youth through a new programme. How have your ideas on learning in the city developed, changed or become clearer over the 10 years since Pedagogical Factory took place? What do you want to accomplish in this second show about education that is different from the first? JD: I am not certain that my ideas about learning have changed much since Pedagogical Factory. It was an important moment for me and for many others to ask better questions about the city and whether it was a complicit site for the encouragement of diverse, imaginative self-learners. My plan with the Stockyard Institute will be to continue building platforms in order to develop relationships. The aim is not to confront the instincts of the status quo in order to resist reasonable methods for contemporary learning, but to reassure and insist to the young and to anyone else that they can build the types of spaces that provide the best opportunities for them to do their work. Pedagogical Factory stirred the pot. At that time I felt that HPAC was perhaps the only place that this exhibition could have taken place. The development of the Youth Art Board (YAB) was a critical initiative that the exhibition left behind at HPAC. It took a collaborative approach, with local high school students and then-HPAC staff, Blake Bradford, Ray Yang and myself. Although Pedagogical Factory raised many questions and anticipated a local pedagogical turn, the YAB operationalised the sentiments of the exhibition. PUBLIC SCHOOL will accommodate – with greater focus and intention – the needs of the young and of self-educators, as well as the random wisdom of experimenters. The space will be in use for twice as long as it was for Pedagogical Factory, to build objects, publications, ideas and relationships that folks can use and include in their practice over the next 10 years. Just as Pedagogical Factory mined serious questions, PUBLIC SCHOOL recognises what is happening in Chicago and what needs to happen. We are on our own to a large extent and schools will always supplement the smallest portion of our general education. We will provide a dynamic and interactive space for anyone to spend time wondering, meeting, teaching, exchanging, caring and hopefully realising the vast and indelible amount of space their self-education occupies. RH: At the time of Pedagogical Factory, I was leading the family programmes division of the museum education department at the Art Institute of Chicago. The work my colleagues and I were doing, across institutions of intergenerational arts education outside of schools, felt like a secret we didn’t want to keep to ourselves. It was so difficult, however, to find the language to communicate our belief that there did not need to be such a vast chasm between the ways that we teach art and the ways that we experience and make art in the contemporary world. Pedagogical Factory cracked open a space for these questions to be brought forward in a range of practices, but it also initiated a palpable change in what experimental city educators felt might be possible in educational art. In the intervening decade, Chicago social practice has come to a self-reflexive understanding and yet directly-educational socially-engaged artworks are still largely left out of high art discourse. At the same time, the past decade has marked the most significant turn towards school standardisation in the history of compulsory education. There has been an exponential increase in higher education tuition costs and a remodelling of college students as consumers instead of scholars. The influence of prison systems on school policy has increased significantly and has ushered in corporate school reform so suffocating that we have now witnessed the first major municipal district (in urban New Orleans) to end all public schooling. This is a fact not stated often enough, and it sets a frightening precedent for all cities. The Recovery School District of Louisiana is run entirely by corporate charters, not by the people, and arguably, therefore, not for the people. And so, the PUBLIC SCHOOL inquiry, to me, continues to be rooted in the same guiding questions about why such a significant gap exists between how we teach art and how we experience and make art. These questions are also expanded to examine why such a significant gap exists between how we teach and how we live most fully. APQ: Part of the reason I wanted to do this show was to encourage open discussion on the state of education. Chicago has one of the most corrupt public education systems in the nation and I don’t think we as a community are talking enough about the problem or exploring solutions. For several years, Jim has talked about creating blueprints or a handbook/model for a school aligned with his understanding of how we learn. Part of the problem is that this language of education is already inadequate and triggers the sensation of boredom and bureaucracy, like the term ‘public school’. No one wants to go there, yet it should be a vital pillar of the community, a Petri dish of progressive activity and a sanctuary from which we can challenge the system. This is why the title PUBLIC SCHOOL is perfect, because it’s an effort to reclaim ‘school’ as an inspirational concept for learning in this century. Similarly, HPAC has been running an art school based on a 1940s fee-for-service model that has seen attendance steadily decline. The intention was for both of you to have a hand in helping us remake the school – returning HPAC to its origins as an artist-run space and establishing a purposeful and authentic space for creative and critical education without financial, geographic, age-based or psychological barriers. What does this space look like and how is it programmed? JD: I would think first about what will propel the school. How does a 1940s-model school work in order to operate as a centre and a place of gathering, collaborative work, shared ideas and needs? I have considered how different sections of the population could interact and share artistic wisdom. The HPAC school may have two directions as you consider the short term (5 years) and the long term (25 years). The first direction is a self-sustaining model, led by members of HPAC who have an excess, who use the space and are willing. This would require commitment from teachers and students to acquire hours they could use in various capacities through the art centre as a core teacher pool. What could a large, eclectic, non-hierarchical pool look like? Could the compensation be something other than money, such as space, education, certificate work, pipelines to other institutions or even centres? The second direction is an endowment, a school underwritten in total, gradually, by its membership or by the teacher pool itself. Chicago bike shops, the local orist and food exchanges are moving forward different economies of sharing, exchanging, centralising work forces, sharing resources and lowering costs. An income scaling of costs as tuition is fair but any costs, financial or otherwise, should be consistent with all the work undertaken at HPAC, as this would impact all areas, initially both favorably and unfavorably, which may be obvious. This is intentionally vague, as hard questions do not need to be ironed out here. RH: For me, the heart of this question is how to liberate teaching artists from their own artistic training. It is clear that arts education is experiencing a crisis: reproducing an authoritarian pedagogical mode where the teacher has the knowledge and therefore teaches, and the student is an empty vessel to be filled or a consumer who devours knowledge but has no direct role in the transformative activity of learning that follows the act of consumption. This means that education is often judged in the precise terms that commodities are judged: is this worth the price? And yet, education is not functionally a commodity, nor is it even a service! And so, students are at a loss as to why operating it in this way feels so unsatisfying when nearly everything else in our culture operates perfectly through this model. As Paolo Freire and many others have cautioned, when you begin with the idea that the teacher will teach from a master knowledge set, you are certain to enact a curriculum that reproduces the current social order in which said knowledge is rooted. This necessarily means reproducing the oppressive systems of that social order. Given the mechanical and sociological dimensions of how learning works, my ideal art school is exactly like a preschool, which is the most sophisticated schooling design I am aware of. For a preschool model to work in a place like Hyde Park Art Center, teaching artists would have to be empowered to teach like preschool teachers: to create conditions for focused play, to notice when a student has found her work and wait for her to approach with questions about how to carry out the work after she has exhausted her own explorations. The teacher’s work, like the contemporary artist’s work in the collective studio, is to deepen the wonder, aestheticise the inquiry and play well with others. This does not mean that there is no structure in such a school. On the contrary, it means borrowing structures from modes of operating that are creative and aesthetic, as in contemporary art, not compliant and anaesthetic, as in formal post-preschool education. APQ: PUBLIC SCHOOL returns us to learning trades or craft and skills like welding and woodworking, as well as activism and storytelling. You raise questions about what is learned and who determines that curriculum, which is very important to revitalising art education. 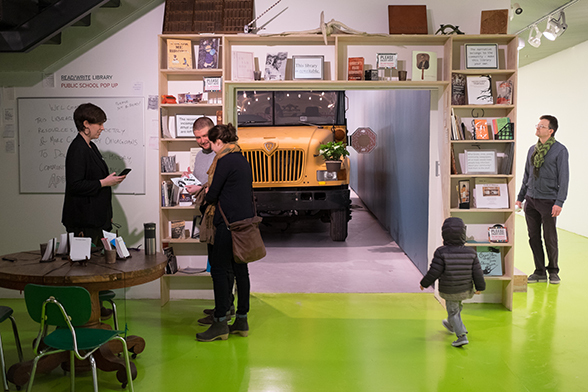 No doubt the icon of the exhibition is the Utopian Center for Civic Love, a decomissioned school bus that has been gutted and made into a kid hangout and studio for the show. The name recalls the sentiment of Paulo Freire, that education is an act of love. The bus is also a metaphor for mobile learning, which Jim has experimented with in the Nomadic Studio (a show at DePaul Art Museum in 2010). It reflects his interest in multi-use maker spaces/meeting hubs that can open or close and move on at a moment’s notice. Why this interest in mobility and how does it benefit learning? Can you talk about why you named the bus Utopian Center for Civic Love and how that connects to your thoughts or needs for education in the city? JD: The Utopian Center for Civic Love was coined by Rachel. I heard her describe the space she wanted to build and it rang with an absolute perfection. The bus, like other smaller works in PUBLIC SCHOOL – the painted piano, the stage conference table, the freak bicycles and other pieces that will be built over the run of this exhibition – are objects of curiosity that reach back to our early childhoods. We have had many conceptual conversations over the last year, imagining what bringing our studios together might look like in the most exact and intentional ways. It also combines lived practices to include works by humans of every age, as Rachel focuses on the cultural production of the very young and the deliberate exclusion of their work from mainstream institutions. This research conducted by Seen + Heard raises an essential question that gets to the heart of what I work against. Namely, why so many youth might struggle to nd their place in a city and their way forward. APQ: Rachel, perhaps you can talk about the intergenerational approach to learning that is important in Freire’s work and how you interpret the Utopian Center for Civic Love. RH: The term ‘love’ is one that we haven’t traditionally used in mainstream education, but I’m glad to see it coming into discourse as ‘radical love’. It comes particularly from critical pedagogy traditions that began in the 1970s and were aimed at dismantling the root of power imbalances by overtly and unapologetically strengthening loving community bonds. As corporate interests tighten around mass schooling, it grows colder. Languages of ‘radical love’ become more necessary and this is probably why we are now seeing them employed. I took a lot of ak from other educators when I started using the word ‘love’ about 10 years ago to describe the heart and motivations behind teaching and learning. In a similar way to Jim’s assertion that contemporary art is “technical, conceptual, and relational”, it is my belief that the core operation of learning is always facilitated by the pedagogical bond, which – if we are being clearest – is a relational bond of love. This does not mean that we necessarily love each student, though that usually helps. Rather, in a broad spiritual way, we extend a love for the world. The pedagogical bond is made through the ability to become fully present with learners. I believe that a powerful utopian network exists in Chicago, like a system of roots underground stretching through every neighborhood, between people of all ages, which begins to glow brightly when we make ourselves present and loving enough to perceive the interconnected bonds of civic love all around us. Individuals and communities who practice radical love make these roots stronger, warmer, more effectively connective and thus educative. As Ada Grey, age 12, self-educated in Chicago, said in her opening remarks for PUBLIC SCHOOL, “Education is all around us, if we have the ability to help each other see it”. PUBLIC SCHOOL exhibition, 2017. Hyde Park Art Center, Chicago.